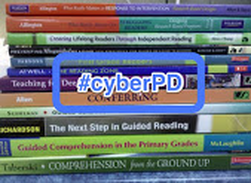 This week is week three of #cyberPD, a virtual book study group. The group is reading and discussing Dynamic Teaching for Deeper Reading: Shifting to a Problem-Based Approach by Vicki Vinton. You can find out more information about #cyberPD here. 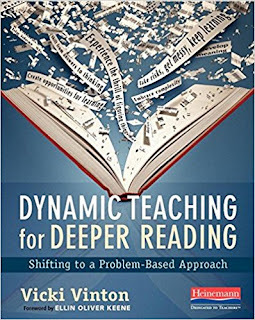 This week #CyberPD is discussing chapters seven and eight of Vicki Vinton's book Dynamic Teaching for Deeper Reading. 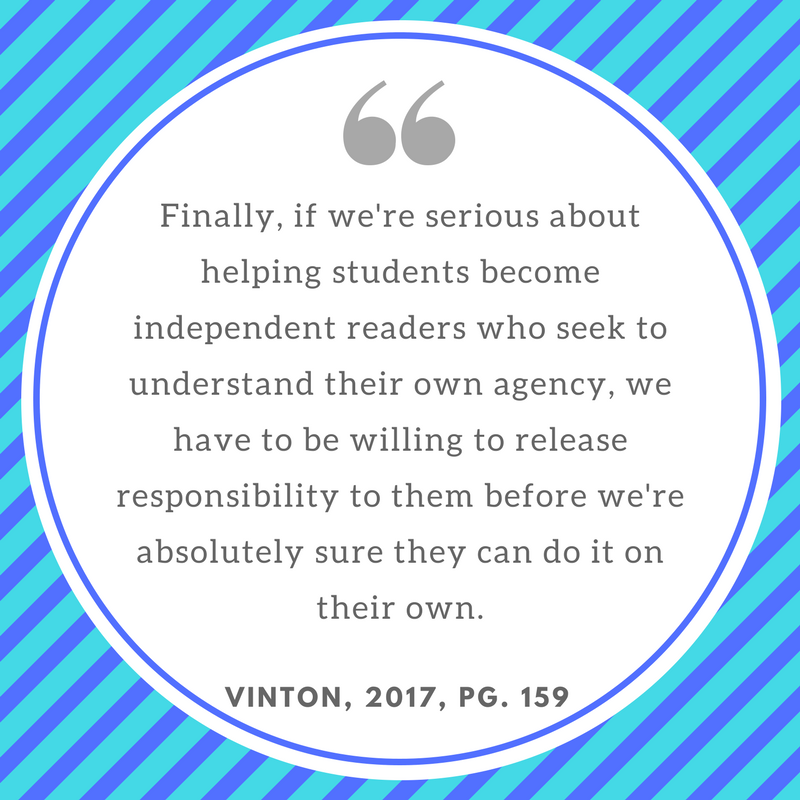 In each chapter, Vinton gives an example of a problem-solving session along with an explanation of core practices used within the session. One chapter is focused on supporting students as they interpret text and the other on understanding nonfiction. As I read through each problem-solving session, I found there was a lot of valuable information to digest. I find myself rereading multiple times and making a lot of notes. 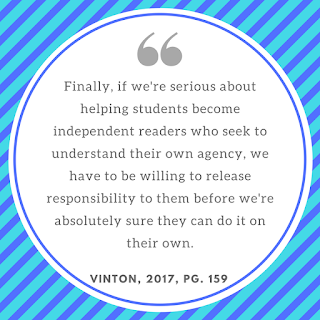 The examples that Vinton provides in the book are helping me to deepen my understanding of the reading process and how I can talk about it with my students. Reading is a process of inquiry, in which readers notice patterns and build understanding bit by bit, and our reading instruction is authentic when we engage students in this process. Interpreting a text requires studying the text as a whole; meaning is made when the patterns of a text are considered together. Thinking about a text changes as we read. Using words such as, "maybe," "could," and "might" opens up minds to the possibility that ideas could change. Understanding nonfiction involves more than just knowing facts. In order to make sense of nonfiction readers must understand how facts are related and what the facts imply. Nonfiction presents unique challenges for readers and confusion is a normal part of the process. Students are able to learn from nonfiction text when they are able to work through the confusion. I chose this quote this week because it gets at the heart of a problem-solving approach. Students need to be allowed the opportunity to do the real work of reading. Letting students take on more responsibility and withholding scaffolding so they can do this real work can seem like a risk. Vicki Vinton assures us that this is a risk worth taking and, although instruction may get messy, students will be empowered to become deep, engaged thinkers and readers. I loved that quote, and also the connection to rich tasks in math!